After several years of market research and technological development, ORIGINAL VIDEO has introduced its latest model: an innovation for the market of movie rental and sale. It is called OVCOM2 and thanks to its 3 new patents, it has unequalled benefits: 33% more capacity for the same price; a reduction of time in the returning process superior to 50% and a reduction of time of movie rent superior to 40%. 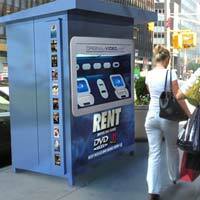 A kiosk like a video ATM with two screens to rent DVD, Games for PS2 and XBOX and Video, with an interactive keyboard that increases its functionality, two slots for renting and one for returning. Internal changes that increase storage capacity four times, with a new system that allows storing 4 DVD’s in the space of 1 VHS. - It has been designed and tried with the automated DVD rental customer in mind, so the investor can be sure that customers will be satisfied. - It comes from a reliable company that not only commercializes the machine but also is its manufacturer. There are no middlemen, so the customer can get first-hand information. - The technical assistance staff is highly qualified and involved in the production process of the distributor, so they know all the details of the system. - It's based on a very new system that provides a faster service; in fact, it is the fastest automated distributor in the market, with 9 to 15 seconds of delivery responses, depending on where the copy is stored. This means it is 15 and 25 seconds faster than the market average. - We simplify the returning process, since we have an exclusive returning slot. Automated DVD rental users can return the copy scanning it over the barcode reader and it's returned in less than 3 seconds. We have also added a new intelligent function to allow returning films that have been rented within the video store. 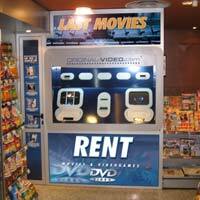 - Automated DVD rental users can movie rent in a very easy way, moving through easy and user-friendly menus. You choices are shown on a colourful and luminous TFT flat screen, and you can pick up your movie from below the keyboard without moving an inch. - The dynamic storage is structured in a completely new way, making the most out of our slim DVD cases 4x1, that is, where we put a VHS, we can keep 4 DVD’s, with a maximum storage capacity up to 1500 items. - Our automated DVD rental video store maximum storage capacity can be increased up to 50%, depending on everyday rental, since we can reach a virtual capacity above 2000 DVD’s. This intelligent system can get the most out of the storage capacity, since it automatically unloads the movies that are less rented. - Our automated DVD rental video store has a robust structure, of high resistance and durability, designed to bare the hardest external conditions. Antivandalic glass and paint, with built in light, it doesn't need any other additional illumination. 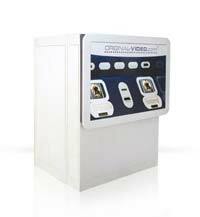 - The returning slot or box of our video store allows customers to return rented movies automatically. - Access system with or without membership card, keying in the user's name and pin. These cards are very economical and safe since they are barcoded. - Automated DVD rental users can buy movies, games for PS2 or XBOX, cd´s… everything that can be inserted in a VHS or DVD case. A very new system that allows you to buy already viewed movies, so we get more benefits with our video store: those provided by the rental as well as the sales. - High technology credit card reader. - Easy to use: Automated DVD rental video store members can easily access the keyboard, making the rental convenient, without losing any of the multiple options such as: looking up for movies keying in the titles, writing messages addressed to the owner of the video store, changing your password, sale menus, videogames menus, exclusive menus for the owner or the management of the video store. - Interactive and complete keyboard that allows access to the video store without a membership card, and communication with the shop's staff, and best of all: allows new memberships 24 hours. - Promotions: If you were interested about using the flat rate, you just have to pay a monthly fee that will allow you have up to 2 DVD’s out at a time and to rent more DVD’s once returned at least one of the already rented. - Our automated DVD rental allows introducing the new technologies of home entertainment like the Blue Ray, HD DVD... and of course the DVD rental.